With its hugely varied terrain and decent snowfalls, Sunshine Village ski resort has some of the best skiing in the Banff area. This resort offers some fantastic steeps and tree skiing. Here you’ll get some of the region’s best chances for dry and plentiful powder. Sunshine is home to the Banff area’s only real ski-in ski-out accommodation: the (newly renovated) Sunshine Mountain Lodge. This resort gives you the opportunity to ski both Alberta and British Columbia in the same run. The resort is spread out over three mountains. It does take some time to transition between them. If it’s a powder morning, get out of the gondola at the Goat Eye Gardens stop and do some laps off the Goat’s Eye Express. Sunshine is located about 20 minutes from the town of Banff. Parking lots can fill up on busy weekends. Sunshine Village is Canada’s highest ski resort, so it’s not surprising that it has plenty of extreme terrain for adrenaline junkies. But beginners and intermediates will also have a blast here since there are plenty of gentle slopes and fun groomers. Added to all of this is some pretty spectacular scenery that will leave you breathless – that is if the slopes haven’t already! The funny thing about Sunshine Village is that there isn’t always that much sunshine, thanks to the predominance of snowy days. And while we’re being pedantic, there isn’t really a village here, either. So the name’s a bit odd, but we won’t hold that against them since this is a fantastic resort and well worth a visit. The main resort base is actually at the top of the gondola. It is comprised of a cluster of lodges scattered amongst the base of a few lifts. In this ‘village’ you’ll find all the services you need, including daycare, cafes, cafeterias, restaurants, bars, the Sunshine Mountain Lodge (Banff area’s only ski-in ski-out accommodation), lockers and the main ski school meeting point. 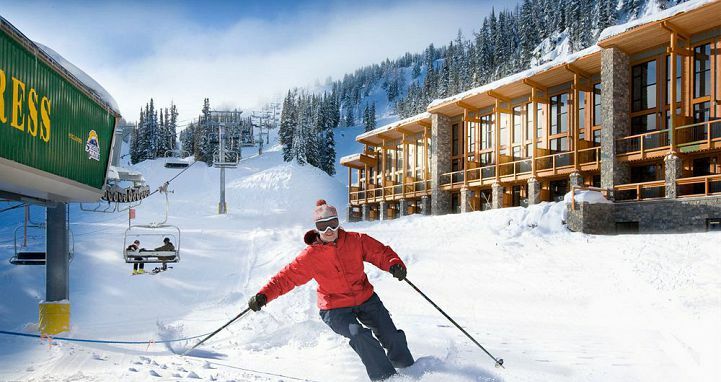 (Rentals and tickets are sold at the gondola base station in Creekside Lodge). Ironically, when Scout visited Sunshine Village it was anything but sunny. Instead it was one of those fantastic ‘free refill’ powder days where it just kept on dumping and, even better, the fair weather skiers all went inside. This gave us lap after lap of fresh tracks on the Goat’s Eye express where we were yodeling with joy until, sadly, a tree didn’t move when it was supposed to – resulting in a tweaked knee that prematurely ended the day (though fortunately not the season). It always happens when you’re having so much fun. Sunshine Village has some awesomely varied terrain, and with 3358 acres (1,358 hectares) of it, there’s enough to keep skiers of all standards happy for days. Even first timers will enjoy themselves here – there’s a magic carpet area right near the base area where they can learn the basics. For beginners there’s a lot of lovely rolling terrain, particularly the runs that can be accessed by the Strawberry Express Quad. 55% of the terrain is marked intermediate, although this is hard to believe given that so many of the trails are marked black. Advanced skiers will have the most fun on these two mountains: Lookout and Goat’s Eye. The latter has some fast groomers, decent steeps, moguls and gladed runs. It’s also the pick on a powder day. If you’re an expert skier that loves a challenge, there are two areas called Delirium Dive and The Wild West that have unmarked but patrolled terrain and are marketed as Canada’s most extreme off-piste. Access is only granted if you have your own transceiver, shovel and probe, and are traveling with a suitably equipped partner. 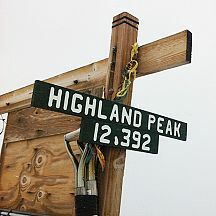 They’re often closed due to avalanche hazard. Meanwhile, there’s a decent terrain park for those looking for jumps, rails, spills and thrills. It also has the region’s only half pipe (when conditions allow). Sunshine is great for families, particularly due to the variety of terrain on offer. 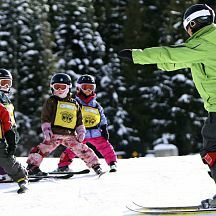 There’s a good ski school, and facilities cater to kids who are skiing for the first time, through to seasoned experts. The daycare is located at the village and is suitable for children aged 19 months-6 years. It’s open from 8.30am-4.30pm and a full day costs $53 with lunch an additional $10.50. Sunshine Mountain Lodge is the resort’s only accommodation option and the region’s only ski-in ski-out accommodation. It is newly renovated and has some great facilities. Read more about it in our review. Downtown Banff offers a greater variety of accommodation options. Apart from skiing, there isn’t much else to do in Sunshine Village, probably due to its location up on the slopes. However there is a ‘Historical Snowshoe and Fondue Tour’ that starts at the top of Mount Standish. This tour will deliver some stunning scenery, as well as insights into the area’s history – particularly its discovery by European explorers. Hot chocolate and cookies are provided, and it culminates with a traditional Swiss-style cheese fondue at the Sunshine Mountain Lodge. The tours cost $120pp and take approximately 3.5 hours from the Sunshine Village base. The gondola base of Sunshine Village ski resort is located in Banff National Park, just 20 minutes’ easy drive from downtown Banff (which is about an hour and a half west of Calgary – see the Banff profile for how to get there). There is a big parking lot at the Gondola base but we’ve been told that it can fill up on busy days. There are frequent shuttle buses from Banff in the mornings and afternoons, and if you have a tri-area ski lift ticket the bus is free. From the parking lot you’ll need to load onto the gondola; from there it takes another 10 minutes to get to the main village base area (factor this in if going for lessons). At the end of each day you can ski all the way back down to the parking lot. If you are staying at the Sunshine Mountain Lodge, the lifties will help you load and unload your luggage onto the gondola. Sunshine Village opens for the season in mid November and operates right through till mid May. The annual snowfall is “up to” 9 meters/30feet – though the average is more like 7 meters. January and February are particularly cold and snowy. March sees plenty of powder dumps, with more frequent sunny periods, and April and May offer great spring skiing.